A joint initiative by Kerala Tourism, Govt. 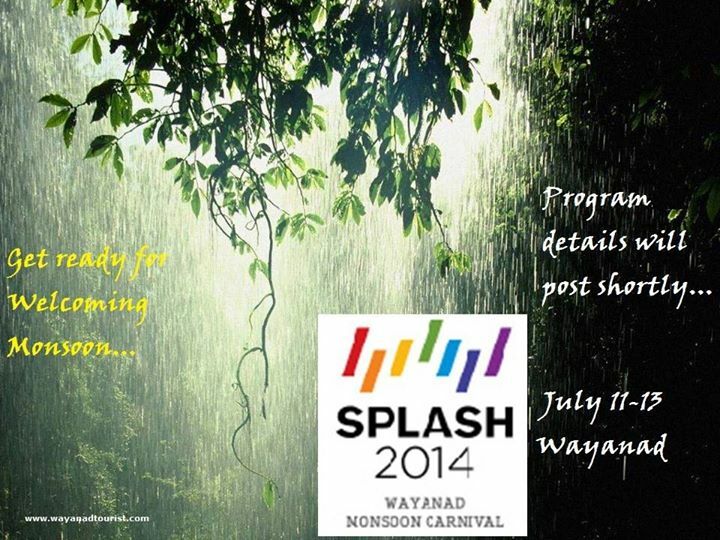 of Kerala and Wayanad Tourism, SPLASH – Wayanad Monsoon Carnival is hosted every year in the month of July to showcase various tourist destinations and attractions of Wayanad.The 6th edition of this unique event is scheduled to be held on July 11th, 12th & 13th, 2014, in Wayanad, Kerala. Splash offers a unique platform for Business to Business (B2B) meet. More than 400 travel agents and property owners interact here to exchange their views and experiences. Register today itself to be a part of the grand event. Business to Business’ meet (B2B) is one of the key attractions of Splash 2014. 11 July 2014 Friday – Arrival Calicut Airport / Railway Station. Meet & Greet Assistance at Airport / Railway Station. Transfer to Wayanad. Check in to the allotted Hotel / Resort / Homestay. ACTIVITIES FOR THE DAY– Free to visit Destination or WTO Member properties of your choice (for transfers to visit destination, seek assistance from the host property and for property visit, seek assistance from the property visiting). Meals of the day At host property or visiting Property (please inform the property / person concerned well in advance, so that they can keep your meals ready in time). Overnight stay in allotted property. 07.00 – 08.00 – Breakfast at host property. 08:30 – Transfer to B2B Venue (Please be ready on time for your transfers). 11:30 – 12:30 – Registration for the next day’s Property Visit / Destination Visit. 17:00 – Transfer to Hotel / Resort for fresh up. 18:30 – Transfer to the Vythiri Village for Cultural Programme and Dinner. 23:00 – Transfer to Hotel / Resort. Overnight Stay. 09:30 – Start for FAM Tour to WTO properties (as per registration) in vehicles with guides. (Please co-operate with guides to keep time schedule). Lunch: en-route at one of the properties. 17:30 – Back to Hotel / Resort for fresh up. 18:30 – Transfer to the Venue for Hosted Dinner. 23:00– Transfer to Hotel / Resort. Overnight Stay.